CANBERRA, Australia — The Australian government announced Monday that the Senate will vote in June on cutting corporate tax rates after an opinion poll suggested the contentious reform had popular public support. The leader of a crucial minor party said she was reassessing her opposition to proposed tax cuts in light of the polling, rekindling government hopes of achieving a key policy promise at the last election in 2016. Prime Minister Malcolm Turnbull's conservative coalition wants to cut the corporate tax rate by 5 percent to 25 percent by 2026-27, but the measure has been blocked in the Senate, where the government holds a minority of seats. Finance Minister Mathias Cormann, the government's chief negotiator in the Senate, said Monday that senators will be asked to vote on the tax cuts when they next sit from June 18 to 28. 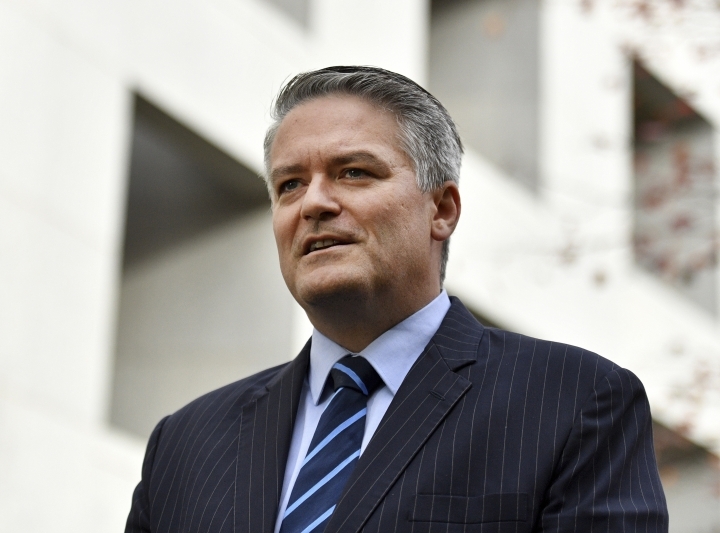 Cormann said the need to reduce the tax burden on businesses had become more pressing for future Australian jobs and investment since the 2016 election because the United States had reduced its top corporate tax rate from 35 percent to 21 percent. "Putting businesses in Australia at an ongoing competitive disadvantage deliberately by imposing higher taxes in Australia ... puts Australian workers at an oncoming disadvantage and that is clearly the point that more and more Australians are starting to fully appreciate," Cormann told reporters. Cormann was referring to a poll published in The Australian newspaper on Monday that showed 63 percent of respondents supported company tax cuts , with 36 percent wanting them introduced as soon as possible rather than phased in over a decade. The poll found 29 percent of respondents opposed corporate tax cuts and 8 percent were uncommitted. The poll was a nationwide weekend survey of 1,591 voters. It has a 2.5 percentage point margin of error. Sen. Pauline Hanson, leader of the anti-Islam, anti-immigration and pro-President Donald Trump minor party One Nation, withdrew its support for the tax cuts last week, depriving the government of three crucial Senate votes. She cited the government's failure to meet One Nation demands, including more trade skills training for young people, reduced immigration and a commitment to building a new coal-fired power plant. But following the poll, Hanson said she would now consider whether the cuts should be implemented sooner than proposed. "I will listen to what the people are saying," Hanson told the Seven Network television. "People can ring my office and they can actually put their message across to me," she added. Tax is shaping up as a major policy difference at elections due within a year, with the center-left opposition Labor Party arguing that the government favors big business over ordinary people. Labor leader Bill Shorten said his party remained opposed to the reform despite the poll result. "I don't need a poll to tell me a dumb idea when I see one," Shorten told reporters. Australia must hold an election by May next year, but could go to the polls as early as August. Turnbull says he intends to call the election in 2019, and his government's poor performance in opinion polls for more than 18 months will not tempt him to call an election any time soon. Support for the tax policy might be tested in five by-elections to be held on July 28. Cormann said the government would continue campaigning for the tax cuts at the by-elections if the Senate rejects them in June.